Available to rent and buy everywhere. 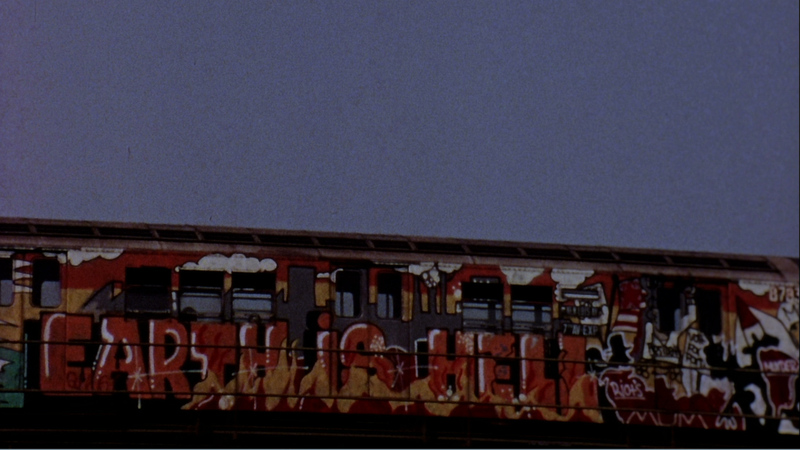 Stations of the Elevated (1981) is a 45-minute city symphony directed, produced and edited by Manfred Kirchheimer. 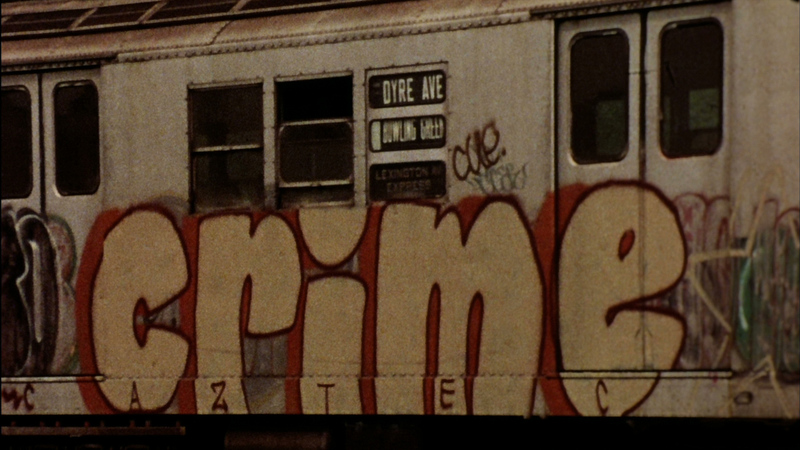 Shot on lush 16mm color reversal stock, the film weaves together vivid images of graffiti- covered elevated subway trains crisscrossing the gritty urban landscape of 1970s New York, to a commentary-free soundtrack that combines ambient city noise with jazz and gospel by Charles Mingus and Aretha Franklin. Gliding through the South Bronx, Brooklyn, Queens and Manhattan - making a rural detour past a correctional facility upstate - Stations of the Elevated is an impressionistic portrait of and tribute to a New York that has long since disappeared. Blade is known as The King of Graffiti - a title that's hard to dispute. He's painted over 5,000 trains but is best remembered for his iconic whole-cars. He chose to paint characters he created instead of appropriating imagery like most writers. In 1980, he began using the trains for his more conceptual works - most notably, his Walking Letters car. Butch and Kase were two of the greatest stylists ever, but they were also responsible for a slew of innovative whole-cars from 1974 to 1977. 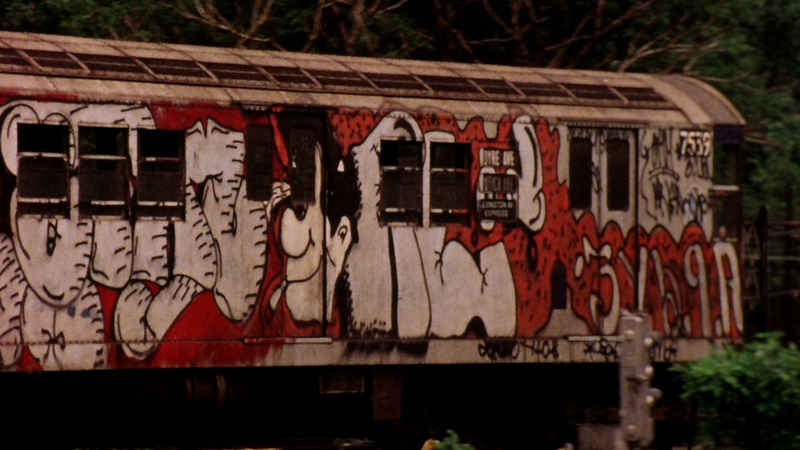 The cars usually featured their names painted in wild style lettering with characters bookending them. At the time, most whole-car specialists went for legible "billboard" style lettering for simple reading. When you think of TF5, you usually think of Lee and whole-car specialists; then there was Slave. He was a master at style and did many of his pieces with the letter A upside down. He reached his peak in 1977, and 1978 and was just as strong since the TDS (The Death Squad) writers were at their peak. Manfred (Manny) Kirchheimer was born in 1931 in Saarbruecken, Germany, and came to the United States in 1936 when his family fled the Nazis. From 1948 to 1952 he studied film production at Hans Richter’s Institute of Film Techniques of the City College of New York. In 1955, he worked with Richter to complete 8x8 and The Passionate Pastime. Also in 1955 he assisted Jay Leyda in reconstituting Eisenstein’s Que Viva Mexico! footage into study reels for the Museum of Modern Art. While working in New York City’s film industry, he was the editor on over 300 films, many for the documentary departments of American television networks: CBS, ABC, NBC and National Educational Television. Beginning in 1963, he was the cameraman for a number of films directed by Leo Hurwitz. In Kirchheimer’s own films there is a decided tendency to explore various aspects of urban life. The subjects he chooses, be they the city’s architectural environment to its graffiti or the docking of an ocean liner, not only reflect the lives of the people implicated in these subjects but also create a frame for a larger understanding of city life. The history of Kirchheimer’s films begins with Colossus on the River in 1963. Haiku (1965) made in collaboration with Leo Hurwitz, captures a set of dances by the choreographer Jane Dudley. Claw (1968), photographed with Walter Hess, a fable in the guise of a documentary, was chosen to launch the Museum of Modern Art’s landmark exhibit “The Machine as Seen at the End of the Mechanical Age.” Other films include Leroy Douglas (1967), Short Circuit (1973) and Bridge High (1975). 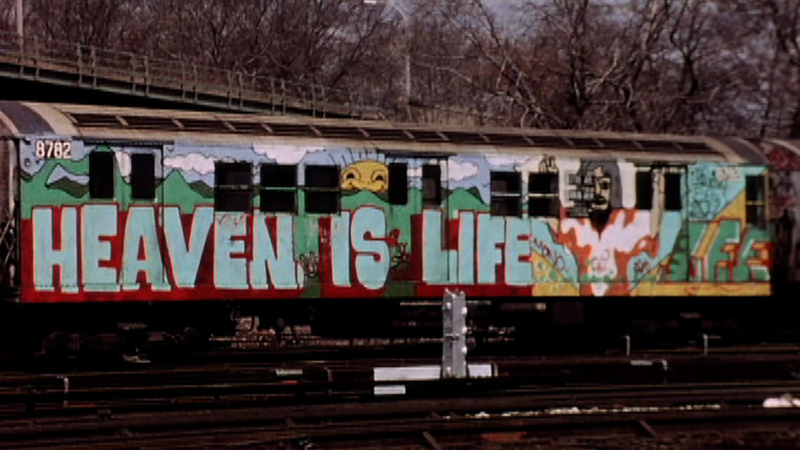 Stations of the Elevated (1980) and We Were So Beloved (1986) are Kirchheimers most celebrated films. In We Were So Beloved (which premiered at New York’s Film Forum), a two-and-a-half-hour film based on interviews, Kirchheimer probes the experiences and attitudes of Jewish refugees and survivors of Nazi Germany, who had created a community in northern Manhattan’s Washington Heights. He has taught at CCNY, Columbia, and NYU, and is today professor of film at the School of the Visual Arts in New York City. Kirchheimer’s latest work includes the acclaimed Spraymasters (2008), Art is...the Permanent Revolution (2012), and Canners, which was recently completed and will begin screening in 2014.